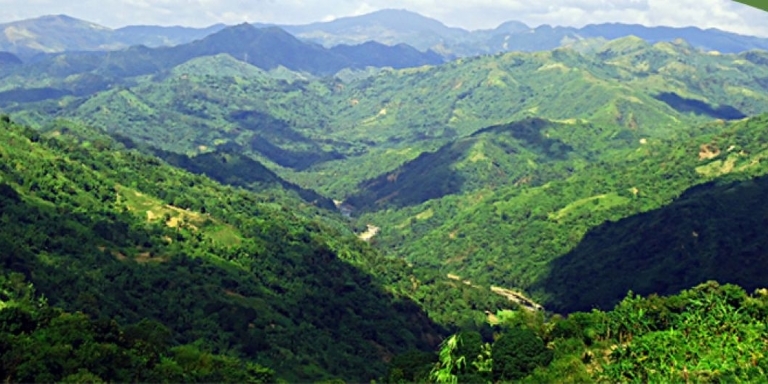 Upper Marikina River Basin Protected Landscape. Photo credit: Southeast Asian Regional Center for Graduate Study and Research in Agriculture (project consultants). At-risk municipalities in the Philippines take the green growth path by building climate change-resilient ecotowns. The Philippines has demonstrated an effective model for "ecotowns," which incorporates both climate change action plans and measures to support sustainable living. It offers a way forward for other countries seeking to go down an environmentally sustainable growth path. An ecotown is an environmentally sustainable community. One of the first known ecotowns is the Kitakyushu Ecotown in Japan, which started a recycling-oriented community in 1997 to reduce waste and improve waste management. In the United Kingdom, an ecotown project was launched by the government in 2007 to develop new, master-planned settlements that showcase zero-carbon development and sustainable living. The Philippines envisions an ecotown as an ecologically stable and economically resilient community. Its national climate change action plan is based on the building of ecotowns at the local level. For this purpose, the term "ecotown" also refers to a planning unit—a municipality or group of municipalities—located within and around the boundaries of critical biodiversity areas (such as watersheds) that are at high risk from climate change. It involves local planners developing a package of climate change adaptation and mitigation actions, along with an integrated ecosystem-based management approach to urban development. What is the Ecotown Framework? The Ecotown Framework was created by the Climate Change Commission of the Philippines to help local governments integrate climate change adaption and mitigation actions into their land use and development plans. The idea behind this is to build resilience at the municipal level, not only by addressing climate change impacts, but also by putting communities on an environmentally sustainable growth path. Source: A. Lapiz, Climate Change Commission (CCC) Ecotown Powerpoint presentation, 2012. Based on the results of these analyses and assessments, local governments identify and prioritize adaption and mitigation measures in consultation with their communities. Why do local governments need a climate change action plan? And why use the Ecotown Framework? Climate change is a global and a national issue. There are however many critical actions that need to be started at the local level to reduce risks from global warming. In this sense, local governments and communities are on the front line of defense against climate change. The Ecotown Framework is designed for urban and periurban areas where economic losses from climate change are particularly high. This is largely because of the increasing fragility of urban ecosystems and the low adaptive capacity of communities. There is therefore a need to develop ecologically stable and economically resilient urban areas or ecotowns. What are examples of ecotowns in the Philippines? The Climate Change Commission has carried out pilot projects to demonstrate the Ecotown Framework under different donor programs. One example is the ecotown project for the Upper Marikina River Basin Protected Landscape (UMRBPL) in Rizal province, which was supported by technical assistance from the Asian Development Bank (ADB) from 2012 to 2015. It has a wide implementation area, involving the local governments of Antipolo City and the towns of Cainta, Rodriquez, Baras, and Tanay. The river basin, located east of the national capital, Manila, covers 26,125 hectares or 48.69% of the whole Marikina Watershed. Before this project, there was no operational model to serve as a step-by-step guide in using the Ecotown Framework. The Climate Change Commission has requested further support from ADB to strengthen the capacity of local governments to use the Ecotown Framework in three critical watershed systems: the Lower Marikina River Basin, the Camarines Sur watersheds, and the Upper East Coast Watersheds of Davao Oriental. Started in 2013, this project involves nine local government units. Ecotown demonstration projects being implemented under other donor programs are in Basco, Batanes; Siargao, Surigao del Norte; and Vicente, Palawan. For more information on ADB-supported ecotowns, visit the project pages. Or contact ADB’s Southeast Asia Department. How was the Ecotown Framework implemented? The pilot Upper Marikina River Basin ecotown project helped the local governments plan, prioritize, and implement projects and programs that not only address the impacts of climate change, but also promote sustainable development. The project delivered four outputs. The first step was to measure greenhouse gas emissions, assess climate change risks, and appraise the economic value of ecosystem services (e.g. production of food and water). Baseline surveys covered five sectors: water; agriculture; health; forest; and roads and transportation. Download the Baseline Information report. Next, community stakeholders and partners identified climate resilience measures based on the results of the vulnerability assessment and greenhouse gas emissions inventory, and prioritized actions using a multicriteria variable analysis (MCVA). They created a green growth road map to implement local climate change action plans that would be integrated into the land use and development plans of the five local governments. UMRBPL Climate Change Vulnerability Assessment Framework. Download the vulnerability assessment reports from the Resources page. Three pilot demonstration projects based on the top three priority climate actions were implemented. Pioneer Species Establishment and Rehabilitation Project Rain-induced landslides/flooding and drought 4 Baras, Rodriguez, San Mateo,Tanay 17,000 seedlings (various forest species and fruit trees) planted in 30 hectares, and 4,000 propagules (bamboo) planted in 20 kilometers in Baras, Rodriguez, and Tanay. The nursery project for San Mateo did not materialize because of project site issues. Check dam Rain-induced landslides/flooding and drought 2 Antipolo City, San Mateo Two check dams constructed—one each in the two implementing LGUs. Communities were trained to make charcoal from biowaste. This will help prevent the cutting of trees, which are used in traditional charcoal production. Photo credit: Southeast Asian Regional Center for Graduate Study and Research in Agriculture (project consultants). The project helped build the capacity of local agencies and partners in climate change resiliency planning and implementation. These involved technical skills training on conducting vulnerability assessment, greenhouse gas emissions inventory, baseline information assessment, cost/benefit analysis, NRM and environmental accounting, and GIS-mapping and analysis. The project also produced guidance manuals. Go to the Resources page to download reports and recommended readings. Asian Development Bank (ADB). 2016. Technical Assistance Completion Report: Climate Resilience and Green Growth in the Upper Marikina River Basin Protected Landscape - Demonstrating the Eco-town Framework. Manila. ADB. 2016. Technical assistance to the Philippines for Climate Resilience and Green Growth in the Upper Marikina River Basin Protected Landscape - Demonstrating the Ecotown Framework. Manila. ADB. 2015. Final Report: Climate Resilience and Green Growth in the Upper Marikina River Basin Protected Landscape: Demonstrating the Eco-Town Framework. Consultant’s report. Manila (TA 8111-PHI). ADB and Climate Change Commission (Philippines). 2015. Project Brief: Ecotown UMRBPL. Manila. ADB and Climate Change Commission (Philippines). 2014. Ecotown UMRBPL: Greenhouse Gas Inventory Report. ADB and Climate Change Commission (Philippines). 2013. Ecotown UMRBPL: Baseline Information. ADB and Climate Change Commission (Philippines). 2013. Ecotown UMRBPL: Vulnerability Assessment for Agriculture Report. ADB and Climate Change Commission (Philippines). 2013. Ecotown UMRBPL: Vulnerability Assessment for Forestry Report. Asian Development Bank and Climate Change Commission (Philippines). 2013. Ecotown UMRBPL: Vulnerability Assessment for Health Report. ADB and Climate Change Commission (Philippines). 2013. Ecotown UMRBPL: Vulnerability Assessment for Transport Report. ADB and Climate Change Commission (Philippines). 2013. Ecotown UMRBPL: Vulnerability Assessment for Water Report. ADB. 2013. Technical Assistance to the Philippines for Climate Resilience and Green Growth in Critical Watersheds. Manila. Climate Change Commission (Philippines). Communities for Resilience. Climate Change Commission (Philippines) and Global Green Growth Institute. 2014. Demonstration of the Eco-town Framework Project in San Vicente, Palawan. Ancha Srinivasan received his doctorate degree from Cambridge University, United Kingdom. He has multidisciplinary experience in climate science and policy, implemented more than 50 climate change projects, and contributed to global initiatives, such as the Intergovernmental Panel on Climate Change, Global Environmental Outlook, and Millennium Ecosystems Assessment.